One of the things I really miss (besides cheese) is mayo. 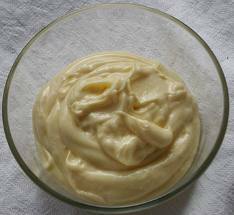 Now, I am very picky about my mayo – it has to be Best Foods (Hellman’s for you East Coasters). I can taste the difference a mile away! Face it, mayo is full of fat and not exactly something I should be eating anyway. But if I am going to eat it, I want the real thing! In fact, the main reason I always order sandwiches and other foods dry (no mayo) is because I don’t want someone else’s bunk excuse for mayo.